LASHING, CHOCKING, BALLASTING AND WELDING WORKS. 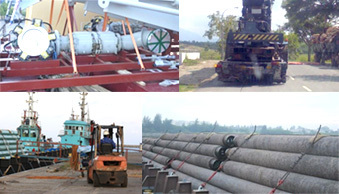 From the brief preview above it is obvious that we are able to meet the requirements of various companies and handle various type of cargo. It should also be noted that we are fully equipped with our own cargo gears, forklifts and trucks, not to mention our own storage facility in the port vicinity. Rest assured that all our equipment have the required certification and are constantly checked and updated. Hence we are confident that we are able to meet all your needs and requirements.